You should know from my post on Jackie’s challah bread that my love for challah runs deep. I’ve made a couple of loaves this year already and then the other day I did something kind of crazy and kind of genius. I turned my lovely challah dough into a batch of sweet and sticky cinnamon rolls. Totally crazy/genius, right? I can’t take credit for the idea, as I got it from someone else, but I’m happy to report that they taste as amazing as they sound. To make the cinnamon rolls, I made my challah dough as usual, but instead of braiding the dough, I rolled it out to a big flat rectangle. Then I sprinkled generous amounts of cinnamon and brown sugar on top. I didn’t measure, but my philosophy here was “more is more.” One thing I thought of while typing this, is that it wouldn’t be a bad idea to smother the dough with softened butter before sprinkling on the cinnamon and brown sugar…not a bad idea at all. I’m going to have to try it with my next batch. After the dough was sufficiently covered with cinnamon and brown sugar, I rolled up the dough, sliced the dough, and arranged the slices cut-side up in a baking pan. Then, I let the dough rest to proof for a bit before baking. They came out of the oven looking perfect and begging to be glazed. So while the rolls cooled for a few minutes, I whipped up a batch of cream cheese glaze and poured a good amount over the cinnamon rolls. 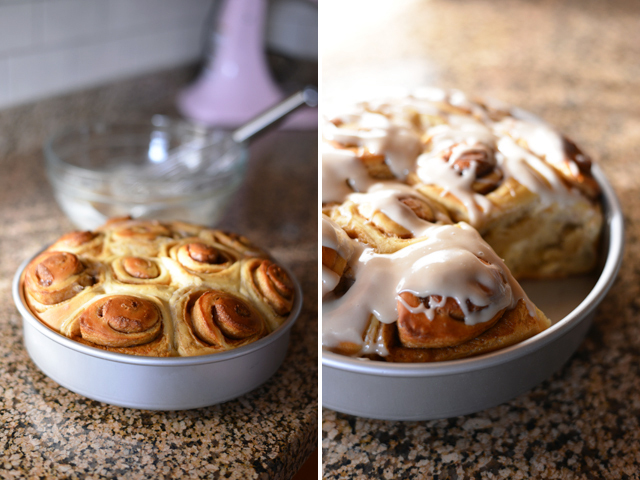 These challah cinnamon rolls are total perfection, especially when eaten warm with extra glaze on the side. With this success, I’m thinking of all the other things I can make with challah bread. Sticky buns and garlic knots are at the top of my list. Any other ideas are welcomed! Make the sponge: In the bowl of a stand mixer, mix together the flour, yeast, and water and let sit for 10 minutes. Make the dough: Add the sugar, light brown sugar, honey, salt, and oil to the sponge and mix with the mixer’s paddle attachment until combined. Mix in the eggs and then beat in 1 cup of flour until fully incorporated. With the mixer on low, continue to add flour, about 2 to 3 cups, until a very soft dough forms. Then remove the mixer’s paddle attachment and replace it with the dough hook attachment. Knead on low speed for about 5 minutes, adding additional flour if needed. Transfer the dough to a lightly floured surface and knead the dough by hand for a few minutes, until the dough feels smooth and springs back when pressed. Lightly oil a large bowl and place the ball of dough in the bowl and turn it to coat it with oil. Cover with lightly oiled plastic wrap and let rise for 1 to 2 hours, until doubled in size. 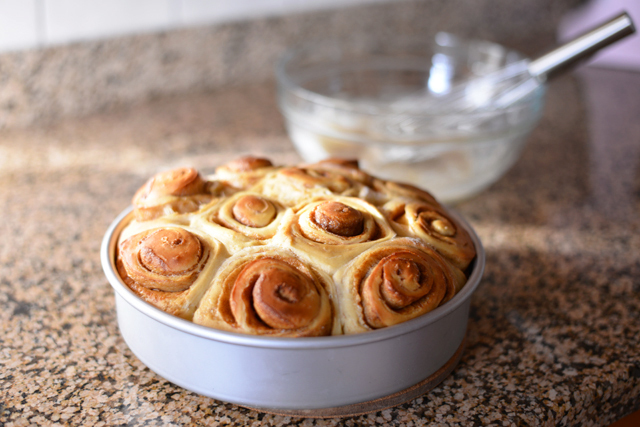 Assemble the cinnamon rolls: Butter a 9-inch round cake pan and set aside. Turn out the risen dough on a lightly floured surface. 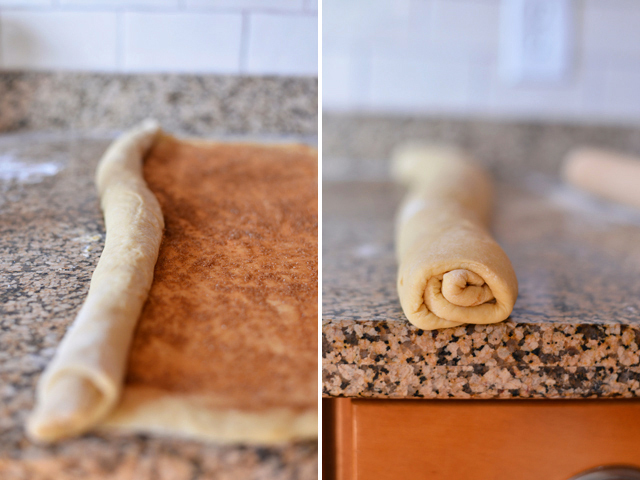 With a rolling pin, roll out the dough to a thin long rectangle. 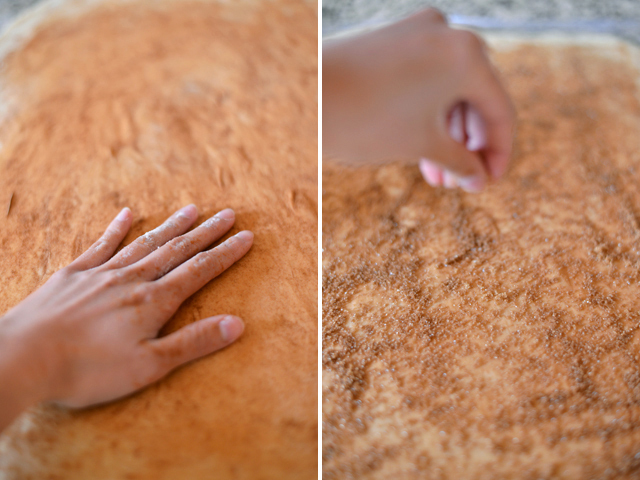 Sprinkle the surface of the dough with a generous amount of cinnamon and use your hands to rub the cinnamon all over the surface of the rectangle. Sprinkle the top of the cinnamon with a generous amount of light brown sugar. Roll the dough tightly, starting from the long edge of the rectangle, until you have one long log. Slice the log into 2-3 inch pieces (doesn’t have to be perfect) and place the pieces cut-side up into the prepared pan. Cover with lightly oiled plastic wrap and set aside for about 30 minutes to proof, until the rolls have puffed up a bit. Meanwhile, heat the oven to 350 degrees. After the rolls have proofed, bake for 30 to 40 minutes, until baked through and browned on top. Set aside to cool for about 10 minutes. 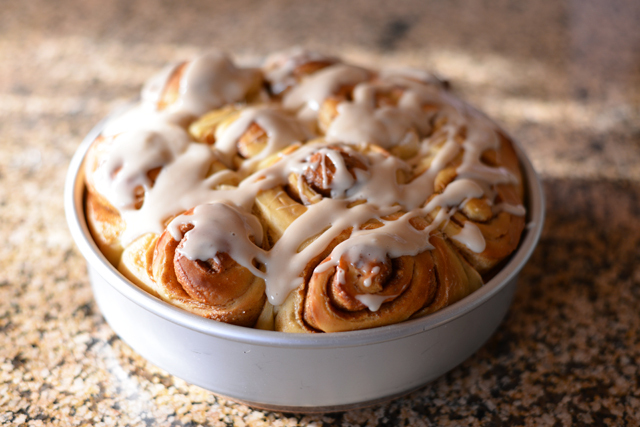 Glaze the cinnamon rolls: While the rolls are cooling, make the glaze by whisking the cream cheese, confectioners sugar, 4 teaspoons of milk, and vanilla extract. If needed, add the additional 2 teaspoons of milk, 1 teaspoon at a time, until the glaze is both thick and pourable. After the rolls have cooled for about 10 minutes, cover the rolls with about half to three-quarters of the glaze. Serve the rolls warm with the leftover glaze on the side. 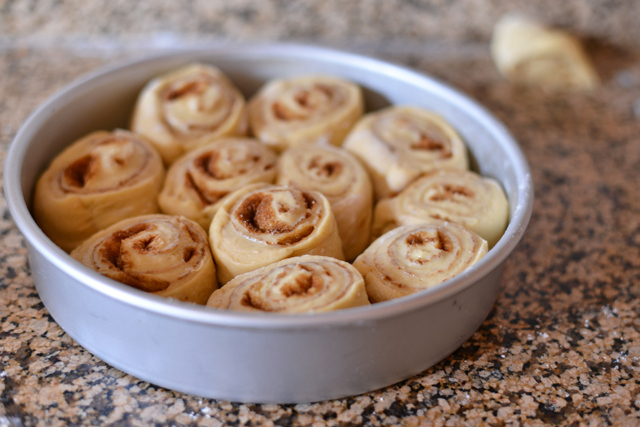 Makes one 9-inch round pan or about 10 cinnamon rolls. My goodness- these look absolutely yummy!!! !